A viewbook printed by Active for our clients Grip Design and Guilford College was recently awarded a Gold Award by the Council for Advancement and Support of Education (CASE). There were over 3300 entries from around the globe with only 300 winning a Gold, Silver or Bronze Award. The Guilford College viewbook on Gold in the Multi-page Publications category. 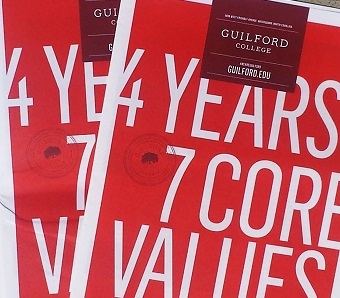 The CASE judges commented on the viewbook’s “bold cover and lighter than expected paper stock visually and physically reinforce the unique qualities” of Guilford”. They also thought the photography was “well balanced and beautifully rendered”. Congratulations to both Grip and Guilford! One of the best parts of our industry is working with smart, creative people to produce something special. 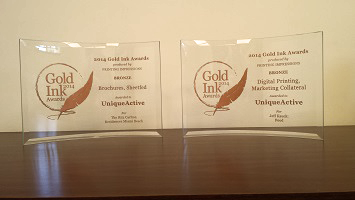 At GraphExpo in September, Printing Impressions magazine announced the winners of the 2014 Gold Ink Awards. Active was awarded two Bronze Awards in the Brochures (Conventional Printing) and Brochures (Digital Printing) catalog. We received the Conventional Printing award for a project we produced for New York based design firm DBOX. The brochure was a 68-page casebound book with multiple vellum flysheets. The Digital Printing Bronze was awarded for a project we produced for Chicago based Liska + Associates. The brochure was a PUR perfect bound, 26-page book featuring the food photography of noted photographer Jeff Kauck. Thanks to DBOX and Liska for giving us the opportunity to work on these great projects!